1500ft 26AWG CAT7 600MHz STP Stranded, UV Resistant PE Jacket, Harsh Environments, Bulk Ethernet Bare Copper Cable - Black. 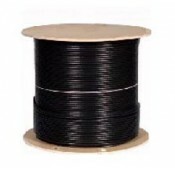 Excellent for harsh environments, indoor or outdoor. Ideal for connecting to servers located in another building. UV Resistant Polyurethane jacket and polyolefin insulation. Resistant to most chemicals, fuels, oils, and materials. Operating temperature range: -40°F to 158°F (-40°C to 70°C). 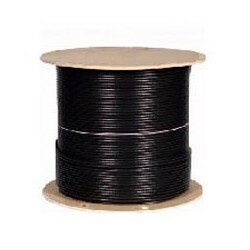 Suitable for portable applications, repeated spooling/un-spooling.